Ahoy there me lads and lasses! Blimey! Good thing me got the compass in the binnacle and checked if we were headed in the right direction because me found that we were not! One of the crew must have miscalculated because we were up drinking rum all night. Anyway, it’s still about another six hours ‘afore we buckos reach our destination so might as well give ye mateys another app review that me sure ye will love. Let me just go to me cabin and I will start writing a review for an app called Best Quotes and Status by Manchester Apps. The app was created with the ease of users in mind. It’s user friendly so you wouldn’t have difficulties finding your way even if it doesn’t have any tutorial on how it is used. With a little exploration on your part, you will be familiar with its use in no time. The quotes and status are categorized making it easier to find the specific quotes or status that you wish to look for. It also helps that each category has an image that corresponds to it, which also makes it easier to find what you are looking for, especially for visual people. There are other apps that are under this genre. However, what makes this one a good choice is that it offers a lot of option so you are not just limited to a few quotes or status that you can easily ready or use up. 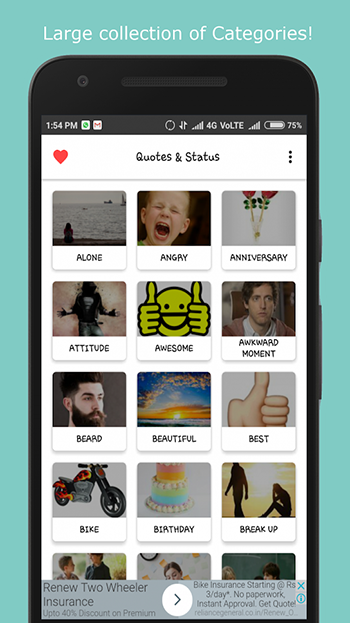 There are over 100 categories and thousands of status and quotes that are continuously adding. This is perfect for those who love sharing quotes on various platforms or people who love reading them for themselves. 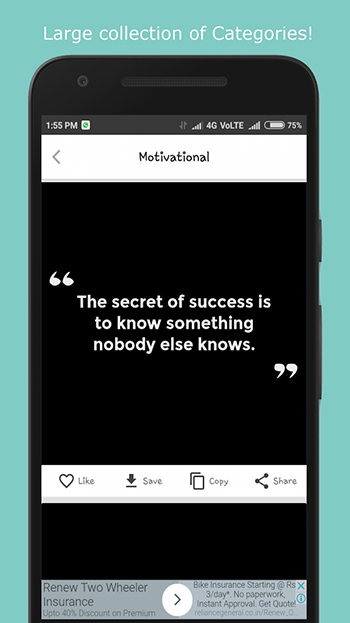 Since many users typically share quotes and status, this app makes it easier to do that as every quote or status has a share option so you just have to choose that to share. It also offers other option that include save, copy, and like; which are conveniently located at the bottom of the quote along the share option. One of the drawbacks of this app is that the quotes only use plain background and there is no way to make edits to make them more eye-catching. An option to edit the background or the quotes having better backgrounds would make it a lot better. Furthermore, there are some quotes that have spelling errors. This app is free to download and it can also be used even while offline. It is user friendly and there are several categories and quotes to choose from. There are also share, save, copy, and like options. The backgrounds are plain and there is no way to edit them. There are also spelling errors on some of the quotes. Best Quotes and Status is highly recommended for those who love sharing quotes on social media or other platforms. It’s also perfect for those who love reading quotes for motivation purposes or just for fun. It has thousands of quotes to choose from, although some may have misspelling and they have plain background.